Get ready for some swashbuckling adventure as you join a band of pirates and search for treasure as you play Tom Horns casino game Blackbeard's Quest slot. This slot features 5 reels and 9 pay lines and if you can’t wait to get started, this online slot is available to play for real money prizes at Easy Slots now. This pirate themed UK online slots game opens with a beautiful tropical beach, with blue skies, palm trees and the sandy beach looking very inviting. The audio immerses you into the game as we hear the rolling waves lapping the ocean floor and the creaking wood of the deck on the pirate ship. Listen closely and you will hear birds squawking as you sail. When you start to spin the audio changes to a jaunty, lively adventure soundtrack, typical of a pirate movie or cartoon. On the reels, there is a pirate ship, a lady pirate, Blackbeard himself, a treasure chest and am image of an island that you may find yourself exploring to dig up some treasure as you embark on Blackbeard's Quest. Tom Horn currently have offices in Costa Rica, Czech Republic, Gibraltar and Slovakia and they have been able to put together a rather impressive repertoire for games in the years that they have been operating and they have built a reputation for providing excellence in the online gaming community. Players love the entertainment value of their titles and come back to play them again and again. They utilise some sharp and vibrant graphics along with cool audio to really draw you into the gameplay. 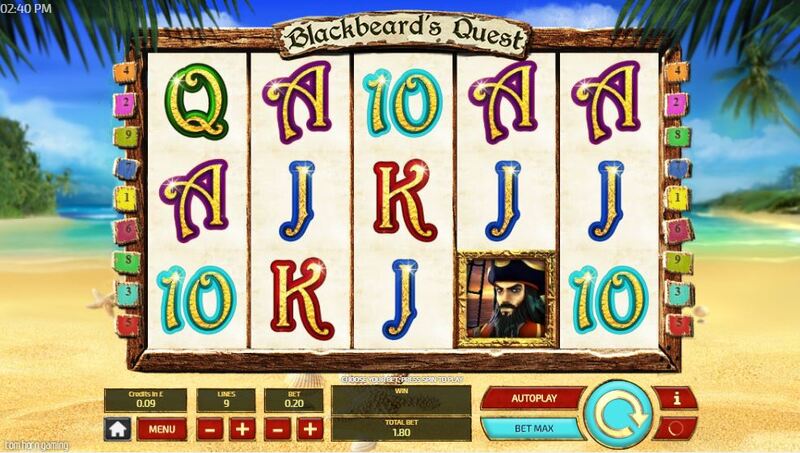 You can play their games on desktops or mobile and if you love this Blackbeard’s Quest slot game check out some more of their titles like Savannah King or Ice Age. Join & Spin! The first feature is the wild and this is represented by Blackbeard and this symbol will substitute for all other symbols on the reels, except the scatter symbols. 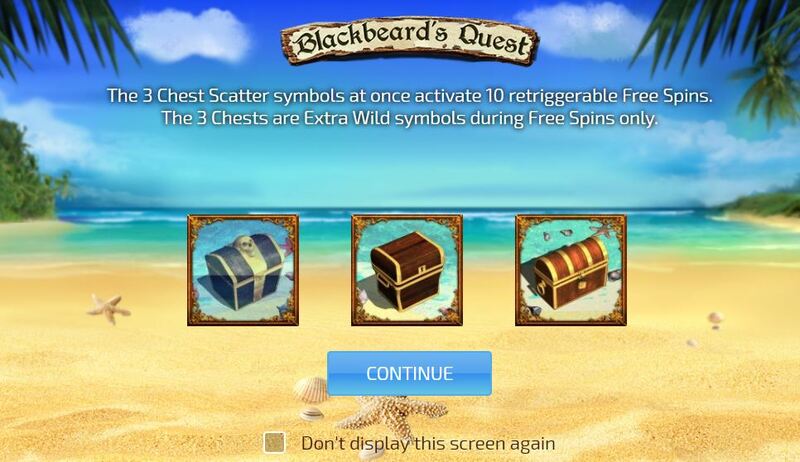 There are 3 scatter symbols in this online slot game and those are the 3 treasure chests. These appear on reels 1, 2 and 5 and if all 3 appear on the reels you will be awarded free spins. During free spins if you land another 3 you will be awarded extra free spins. Free spins are awarded in 10’s and retriggered these during the feature adds the extra spins on to your original amount. This casino slot game also has a gamble feature and after each win you can choose this option to get the chance to win big.